Folks at the Woodrow Wilson Center asked for my thoughts on the recent issue of the JPR (earlier comments here and here). I sent them this comment. Basically, the quantitative empirical findings in the issue support all the existing findings in the literature. There are some new data sets and associated results. But overall, the stylized facts remain unchanged (eg. see here for results and many links). However, to date there is little evidence that the meteorological or agricultural conditions associated with climate change are actually a major source of violence. The study of the relationship between climate change and conflict has advanced noticeably in the past four years. Several recent summaries conclude that so far there is not yet much evidence for climate change as an important driver of conflict [Sol: some of my thoughts on the summary he is referencing are here]. Although environmental change may under certain circumstances increase the risk of violent conflict, the existing evidence indicates that this is not generally the case. but these statements are not supported by the results actually presented in his Special Issue. Below is the breakdown of empirical papers in the issue, which I describe in my NewSecurityBeat comment (yes, I read every single paper carefully and examined the data and code for most of them). 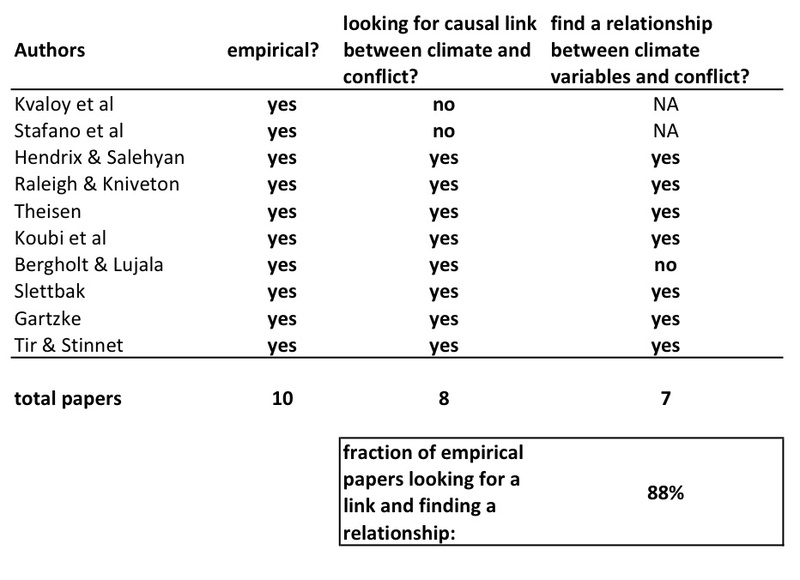 Of the ten quantitative empirical papers, eight asked whether climatological variables influenced the risk of conflict. Seven of these eight papers found an association. If Gleditsch viewed the quality of all these papers to be high (which I assume he does, since he approved them all for publication), I do not see how they collectively point to the conclusion that climatological variables are unimportant. Marshall Burke and I are in the middle of doing a careful review of the quantitative literature (this post is actually taking me away from working on one of our tables) and the JPR findings are generally in line with the results from a much larger body of literature. Stay tuned. Abstract: We present a dynamic model of free riding in which n infinitely lived agents choose between private consumption and contributions to a durable public good g. We characterize the set of continuous Markov equilibria in economies with reversibility, where investments can be positive or negative; and in economies with irreversibility, where investments are non negative and g can only be reduced by depreciation. With reversibility, there is a continuum of equilibrium steady states: the highest equilibrium steady state of g is increasing in n, and the lowest is decreasing. With irreversibility, the set of equilibrium steady states converges to a unique point as depreciation converges to zero: the highest steady state possible with reversibility. In both cases, the highest steady state converges to the efficient steady state as agents become increasingly patient. In economies with reversibility there are always non-monotonic equilibria in which g converges to the steady state with damped oscillations; and there can be equilibria with no stable steady state, but a unique persistent limit cycle. Abstract: Geographic, institutional and political features of developing economies often create significant barriers to the spatial integration of labor markets. In this paper, I ask whether constraints on spatial mobility prevent families from using labor migration to protect infant health from local shocks to the environment, with potential long-run consequences for health human capital accumulation. Working in the context ofapartheid-era limits on free labor migration that affected different parts of South Africa to different degrees and relying on quasi-experimental variation in local drought conditions, I use Census data to construct migration histories and show that adult outmigration from the oldest homeland areas – those areas least integrated with the national labor market – was substantially lower than outmigration from other rural areas during drought years. Then, using a nationally representative dataset of South African women born between 1940 and 1988 and a difference-in-difference-in-differences research design, I show that women born in these oldest homeland areas and exposed to drought in infancy are significantly shorter in adulthood. These results highlight an important source of welfare gain from spatially integrating labor markets where local environmental shocks are prevalent. Eric H. (@scigit) points us to SciGit, a management platform for collaborative research papers modeled after GitHub. It's still in prelaunch but should be available soon, and you can sign up your email for the official announcement if you like. Collaborate with others without the mess No more -version19 John edits anymore. Keep track of changes done by each person and see the differences between papers. Merge edits easily. Version Control Made Simple Simply Drag and Drop and it’ll do the rest, no more dealing with the terminal. Supports SVN, CVS, Mercurial, and Git. Supports Your Favorite Editor Use the same text editor you have now. Have the convenience to work offline. Secure Your paper would be secure and private, only accessible to whom you gave permission to. The motivation for founding ERL was initially more focused: to alter the mode of publication and review in the diverse, yet linked fields of environmental and resource studies and to ensure new levels of interaction, inclusion and equity, providing the platform for the world-changing research findings published in ERL. The key driver in this conversation was the issue of access. Specifically the situation that too many research findings were produced by, and for, very specific academic 'clubs', and that the opportunity to engage in discussion and debate over important emerging findings about our world was being severely limited by the process of publication in frequently slow-to-publish and tremendously expensive traditional academic journals. The need for change was, and still is, obvious. Environmental and resource studies have been the fastest growing and most diverse nexus of academic research, private sector concern and public sector action. Universities worldwide are adding academic and extension professorships and staff as well as experiencing increasing student interest in this area at a record pace. Corporate social and environmental sustainability has been changing dramatically and, in lurching fits and starts, a mosaic of environmental regulations—both carrots and sticks—are emerging worldwide. The 'Rio + 20' Earth Summit in June 2012 will be a testament to both the dramatic broadening of this interest, and the frustration about the lack of progress at building strong global institutions to permit international cooperation. This is a clear call for an on-going and evolving process of community building. they are now doing "video abstracts"
Denyse sent us this smooth GUI for looking at real time conflict data. The Strauss Center's Climate Change and African Political Stability (CCAPS) program has released the pilot version of its dynamic mapping tool. 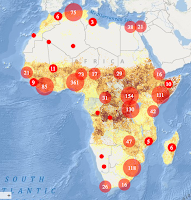 In partnership with AidData, CCAPS developed the online data portal to enable researchers and policymakers to visualize data on climate change vulnerability, conflict, and aid, and to analyze how these issues intersect in Africa. The mapping tool, which uses Esri technology, allows users to select and layer any combination of CCAPS data onto one map to assess how myriad climate change impacts and responses intersect. For example, mapping conflict data over climate vulnerability data can assess how local conflict patterns could exacerbate climate-induced insecurity in a region. It also shows how conflict dynamics are changing over time and space. By integrating the various lines of CCAPS research, as well as other existing datasets, the CCAPS mapping tool aims to provide the most comprehensive view yet of climate change and security in Africa. Please see click here for more information about the mapping tool. The current mapping tool is available through a user-friendly interface at www.strausscenter.org/ccaps/mappingtool. This is the second comment on articles in the recent climate change special issue of the Journal of Peace Research. My first comment is here. Four out of the sixteen articles in this special issue are case studies: Feitelson et al. (Israel-Palestine), Bernauer & Siegfried (Central Asia), Benjaminsen et al. (Mali, discussed here) and Adano et al. (Kenya). I won't evaluate these studies in detail, but when interpreting their results, we should be mindful of the general likelihood of obtaining false-negatives if we use case studies to answer the question "Does the climate influence conflict?" Using our own work on civil conflicts as a benchmark, consider that the likelihood of new conflict in a randomly selected country in a randomly selected year is 3%. That means in 97% of country-year observations, there is no new conflict. We estimated that 20% of conflicts (globally) were influenced by the El Nino-Southern Oscillation (ENSO). This means that 0.6% of country-year observations should exhibit ENSO-related conflicts (since 20% of 3% is 0.6%), or alternatively, that 99.4% of country-year observations should not exhibit ENSO-related new conflict, (even though there is a strong and clear association between the two in large samples). What this means is that if I were to try and detect the relationship between the ENSO and conflict using a case study for a few years in a randomly selected country, I would almost certainly observe "no ENSO-related conflict" (in 99.4% of years). But this wouldn't necessarily be the right conclusion. It's just the conclusion we would be forced to adopt if we only could observe one country for a short period. 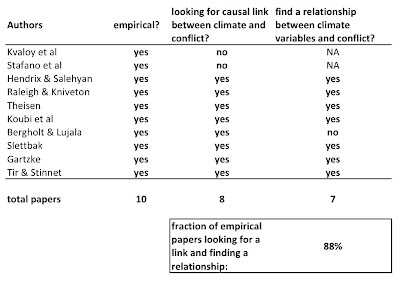 But if we adopted this conclusion,we would be wrong: this null result is an artifact that emerges because conflicts are generally rare events, and only a fraction of conflicts are related to the climate. Thus, in order to get a reliable "yes" or "no" answer to the question of whether a rare event (conflict) is affected by external forcing (climate), we need to observe many populations for many sequential periods. If this unclear, imagine that we want to ask the scientific question: "Do whales exist?" If I went out in a row boat for a day and did a case study of whether there were whales just off my local coast, then I would probably not see any whales. This would be a perfectly valid observation, but I would be wrong to conclude "whales must not exist" just because I didn't see any at the specific place and time when I was looking for them. Whale sightings are rare events and we need to watch many locations for many days to have a good sense of how many whales are out in the ocean. To be clear, I am not criticizing case studies as a method to understanding what is going on in a specific location in a specific point in time. And I am not criticizing the case studies in this issue. All I am saying is that if we read a few case studies that report "nothing to see here," and we are looking for rare events, then it is incorrect to jump to the conclusion that whatever rare event we are looking for does not exist. The undergraduate class I'm co-teaching is getting into the part of the semester where each class is devoted to a major issue in sustainability. Topics we cover range from energy to hydrology to public health; with issues so large and time so limited each class can, at best, provide a very quick overview of the field and the major open problems in it. Given that I have to put together relevant and up-to-date background materials anyway, I figured I might as well put some links to all the materials on the blog for interested FE readers. Following RealClimate's Start Here page, I'm going to break the literature down a bit by target reader demographics so hopefully everyone will be able to find something interesting to chew on. Feel free to comment and give feedback as the topics go up; depending on how much use they get these posts might eventually turn into intermittently-updated pages. On that note, let's begin with the first topic: Global Fisheries. 3) Is high ability necessary for greatness? This is from the innocuously titled paper Influence of the intertropical convergence zone on the East Asian monsoon published in Nature (2007) by Yancheva et al. 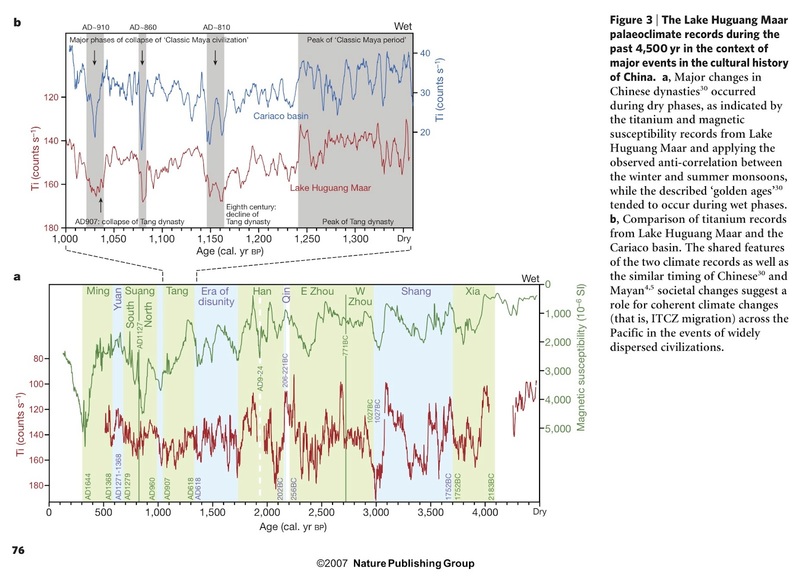 Quote from abstract: "Here we present high-resolution records of the magnetic properties and the titanium content of the sediments of Lake Huguang Maar in coastal southeast China over the past 16,000 years, which we use as proxies for the strength of the winter monsoon winds. We find evidence for stronger winter monsoon winds before the Bølling–Allerød warming, during the Younger Dryas episode and during the middle and late Holocene, when cave stalagmites suggest weaker summer monsoons. We conclude that this anticorrelation is best explained by migrations in the intertropical convergence zone. Similar migrations of the intertropical convergence zone have been observed in Central America for the period AD 700 to 900, suggesting global climatic changes at that time. From the coincidence in timing, we suggest that these migrations in the tropical rain belt could have contributed to the declines of both the Tang dynasty in China and the Classic Maya in Central America." The role of climate and environmental change in the success or failure of societies is a matter of intense debate. It would be simplistic to imagine that all episodes of societal change are driven by climatic events, especially in an advanced and complex society such as dynastic China. Nevertheless, we note that, on the basis of our new Huguang Maar data, major changes in Chinese dynasties occurred when the winter monsoon was strong (Fig. 3). The anti-correlation between winter and summer monsoon strength indicated by com- parison of the Huguang Maar data with the cave records would suggest that dynastic transitions tended to occur when the summer monsoon was weak and rainfall was reduced. Dynastic changes in China often involved popular uprisings during phases of crop failure and famine, consistent with a linkage to reduced rainfall. The Tang dynasty has been described as a high point in Chinese civilization, a golden age of literature and art. The power of the dynasty began to ebb in the eighth century, starting with a defeat by the Arab army in AD 751. Rebellions further weakened the Tang empire, and it fully collapsed in AD 907. It is intriguing that the rise and collapse of the Classic Maya coincided with the golden age and decline of the Tang dynasty in China. 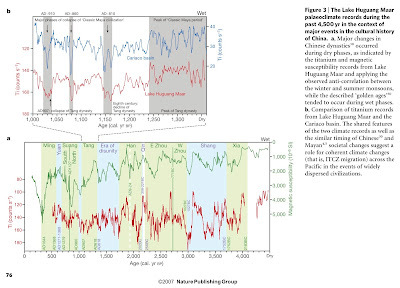 Comparison of the Ti records from Lake Huguang Maar and the Cariaco basin reveals similarities, including both a general shift towards drier climate at about AD 750 and a series of three multi-year rainfall minima within that generally dry period (Fig. 3), the last of which coincides with the final stage of Maya collapse as well as the end of the Tang dynasty. Given these results, it seems possible that major circum-Pacific shifts in ITCZ position catalysed simultaneous events in civilizations on opposite sides of the Pacific Ocean. [O]ne of the difficulties I found in examining the views of climate skeptics is that they are scattered widely in blogs, talks, and pamphlets. Then, I saw an opinion piece in The Wall Street Journal of January 27, 2012, by a group of sixteen scientists, entitled “No Need to Panic About Global Warming.” This is useful because it contains many of the standard criticisms in a succinct statement. The basic message of the article is that the globe is not warming, that dissident voices are being suppressed, and that delaying policies to slow climate change for fifty years will have no serious economic or environment consequences. Is the planet in fact warming? Are human influences an important contributor to warming? Are we seeing a regime of fear for skeptical climate scientists? Are the views of mainstream climate scientists driven primarily by the desire for financial gain? Is it true that more carbon dioxide and additional warming will be beneficial? Even Albert Einstein was not immune to political backlash. His theory of general relativity, excerpted on the notebook page in figure 2, undermined our most fundamental notions of absolute space and time, a revolution that Max Planck avowed “can only be compared with that brought about by the introduction of the Copernican world system.” Though the theory predicted the anomalous perihelion shift of Mercury’s orbit, it was still regarded as provisional in the years following its publication in 1916. "This world is a strange madhouse. Currently, every coachman and every waiter is debating whether relativity theory is correct. Belief in this matter depends on political party affiliation." Instead of quelling the debate, the confirmation of the theory and acclaim for its author had sparked an organized opposition dedicated to discrediting both theory and author. Part of the backlash came from a minority of scientists who apparently either felt sidelined or could not understand the theory. The driving force was probably professional jealousy, but scientific opposition was greatly amplified by the anti-Semitism of the interwar period and was exploited by political and culture warriors. The same forces, together with status quo economic interests, have amplified the views of climate contrarians. 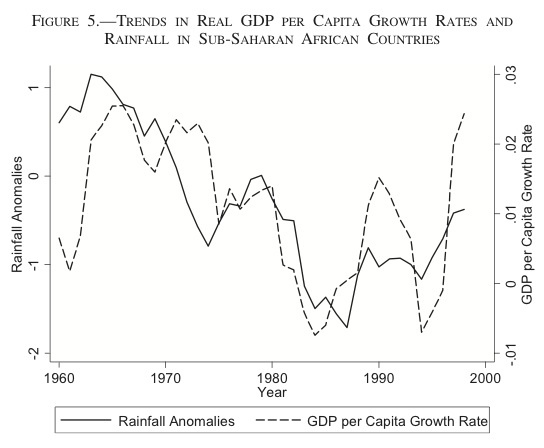 Can rainfall explain a HUGE fraction of economic underperformance in Africa since 1980?! Abstract: We examine the role of rainfall trends in poor growth perfor- mance of sub-Saharan African nations relative to other developing coun- tries, using a new cross-country panel climatic data set in an empirical economic growth framework. Our results show that rainfall has been a significant determinant of poor economic growth for African nations but not for other countries. 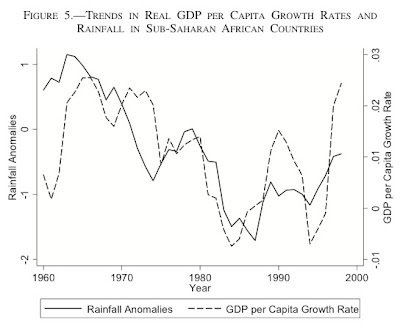 Depending on the benchmark measure of potential rainfall, we estimate that the direct impact under the scenario of no decline in rainfall would have resulted in a reduction of between around 15% and 40% of today’s gap in African GDP per capita relative to the rest of the developing world. Click to see simulation results. 5) The rise and fall of a (large) MMORPG black market economy. 6) "I wanted to understand how massive processes of violence become normalized in modern society, and I wanted to do so from the perspective of those who work in the slaughterhouse." Highly recommended. I don't think any journal editors read this blog, but I'm posting this just in case one ever does. In the scientific literature, if a scientist disagrees with a previously published finding they can submit a "comment" to the journal and this comment is handled a bit like a normal paper (eg. there is peer review). However, for some journals (eg. Nature), the editors solicit a "reply" from the original authors, which is basically a comment on the submitted comment. 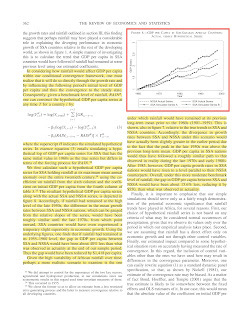 If the comment-reply pair is considered useful for advancing scientific understanding of the original paper (this is where peer review comes in), then they are published together. My coauthors and I have just finished dealing with the third comment submitted in reaction to a paper we published in August. Many people dislike our result and have tried to falsify it. None of these comments have been published, however, because in each case our reply has demonstrated the faulty approaches of the comments. We have learned many things from the process, so in some sense it represents the interactive component of scientific research at its best, but dealing with comments is exhausting. When a comment is submitted, we must read it, think about it, conduct simulations and additional analysis to demonstrate its faults, write up the results, edit the write up and compose a formal review. Given my recent experience, I would guess that each comment consumes about four person-days of work between myself and my coauthors (costing ~$550 at post-doc-like wages). For time-constrained researchers, this is a lot of time. And for us, the authors of the original paper being commented on, there is not much flexibility in timing since journals ask for responses to be submitted quickly (Nature gives ten days). So comments demand a serious time-commitment from the original researchers on short notice. In cases where the original research really had serious issues that are clarified by comments, then this process produces valuable public goods. But in cases where the response is strong enough to prevent the comment's publication (our recent three experiences), then public confusion is avoided (a public good relative to the counterfactual state) at the expense of the original researchers' time and effort. This is a clear externality imposed on the original researchers by the commenting authors. As we know from Econ 101, this will lead to the overproduction of low-quality (rejected) comments in equilibrium, since the full social cost of a comment (the lost time of the original authors) is not borne by the commenting authors. What should be done here? The answer is obvious from Econ 101: we need a Pigovian tax on low-quality comments. We should penalize commenting authors if their comment is rejected, but not if it is accepted. This will force authors with a comment to think hard about the quality of their comment before submitting it and will raise the quality of the average comment that is actually submitted in equilibrium. Society will still get the public good benefits from the strong comments, but authors of original papers will be less burdened by dealing with the excessive supply of low-quality comments. In the current no-tax regime, the oversupply of low-quality comments generates a pure deadweight loss in the form of occupying the original researchers' valuable time and slowing down their research. "We did find evidence that there is an increased risk of climate change leading to conflict in the poorer, politically unstable countries," said Bernauer. "But even in these cases, there are a lot of factors that lead to conflict and it is difficult to isolate climate change from all the other factors." Hsiang et al (2011) study the impact of planetary-scale climatic changes on civil conflict and show that the 'probability of new civil conflicts arising throughout the tropics doubles during El Niño years relative to La Niña years.' Similarly, Burke et al (2009) find that temperature increases in Africa between 1981 and 2002 have a significantly positive effect on civil war onset. They report that a 1 °C temperature increase boosts the risk of civil war by 4.5% points during the same year. Buhaug (2010), on the other hand, shows that this result is not robust to alternative model specifications. He also finds that climate variability, measured as inter-annual growth and deviation from annual mean precipitation and temperature, does not predict civil conflict. Now, there are actual issues and debates in the literature that Buhaug, Burke et al., my coauthors and I have discussed and are trying to understand. But this is a very misleading representation of how the various findings fit together. Buhaug's 2010 criticism of Burke et al. 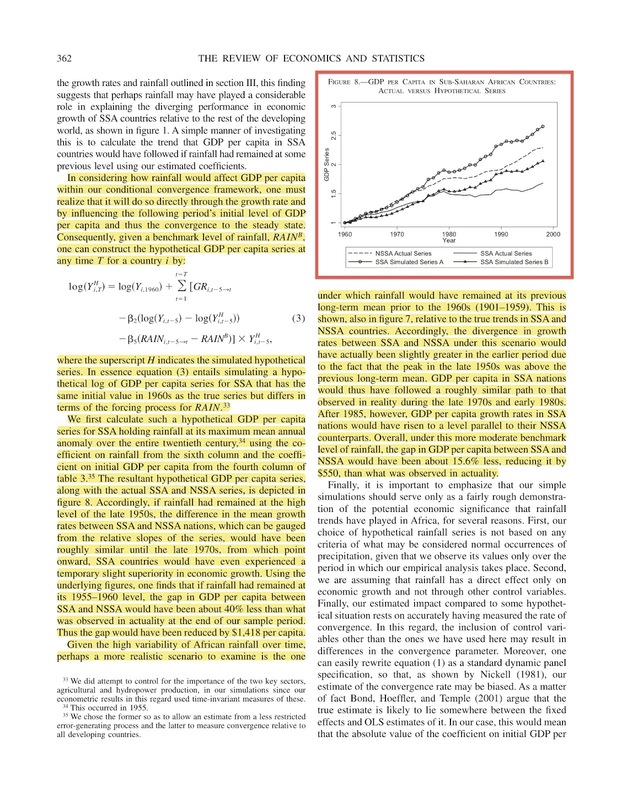 's 2009 paper is a real issue, but it doesn't apply to our 2011 paper. We directly address all of the issues the Buhaug raised, since we were able read them (in 2010) and think about them carefully before we published our paper (in 2011). By structuring the review in this out-of-sequence order, the authors imply that our 2011 results are weakened by 2010 findings that we directly addressed. The authors are careful not to explicitly state that Buhaug (2010) applies to our 2011 paper, but the misleading implicit suggestion that this is the case is neither logical nor helpful for advancing our scientific understanding.